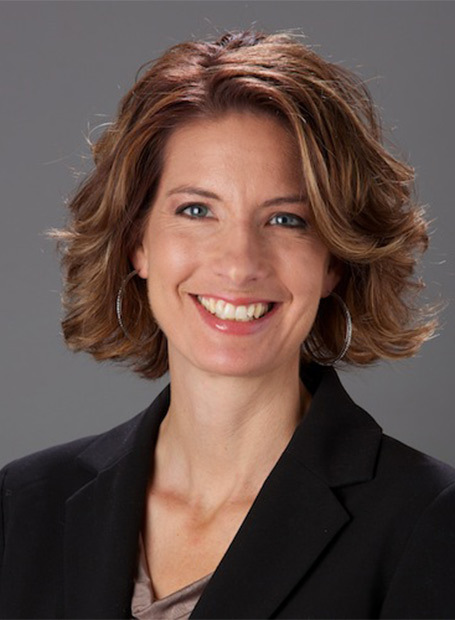 Dr Rebecca Kammer has always felt a strong urgency to serve others and specifically “those under some sort of oppression”. After watching a documentary about the atrocious attacks against people with albinism in Tanzania, she decided to dedicate herself to providing vision care to children with albinism in East Africa to support them in living independently. I am a low vision specialist and doctor of optometry in the State of California, United States. After graduating in Optical Engineering and later Optometry, I started serving on short term medical missions to Honduras and Kenya, taking teams of optometry students and members of my church to serve with me. After college, and as a Christian, I knew I wanted to serve others in a profession and through mission work. I knew I needed some skill to serve in that way and so optometry seemed an ideal profession. After three years of learning and maturing in the area of low vision, I became chief of the low vision department at the college where I was teaching, now called Ketchum University. 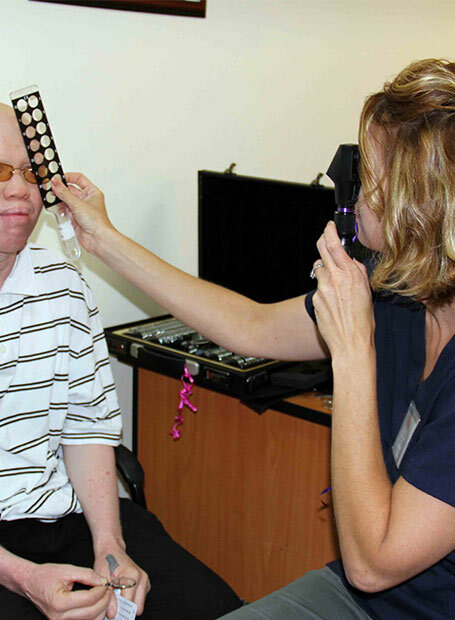 I had several patients with albinism, but my first encounter with the condition outside the United States was through my experience in Tanzania as a volunteer with the NGO Under the Same Sun (UTSS). In the fall of 2009, I was awake watching a documentary on the work of Dr Murray Brilliant, a renowned geneticist on human albinism, and the atrocities perpetrated against people with albinism in Tanzania. 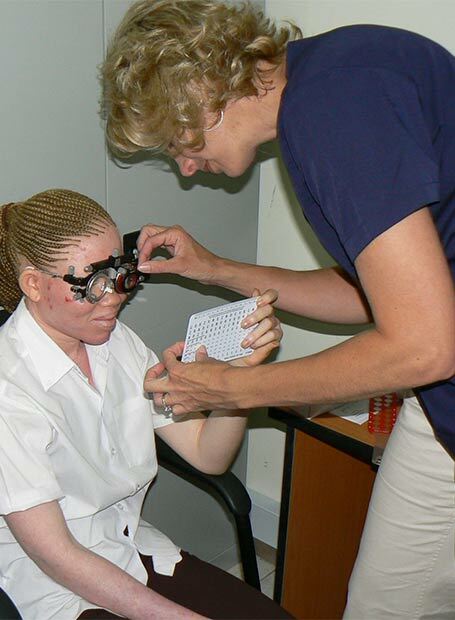 I was incredibly moved and thought that since I had the mission background to do vision work in remote areas and I understood the visual impairment of persons with albinism, at least in the U.S., I could do something to help in Tanzania. It did not make much sense at the time how vision could help with killings and mutilation but that's what I felt in my gut. I knew then that God was pushing on me to do something. That feeling never went away. I contacted Brilliant the next day. He directed me to Peter Ash, Founder and CEO of Under the Same Sun, who had just established the NGO which promotes the rights of persons with albinism in Tanzania and worldwide. Peter was still primarily concerned with safety, but he completely understood what I did as a doctor since he has albinism and low vision. He explained how he had difficulty finding specialists who understood his vision and knew how to obtain specialized magnifying devices for him. He told me he could eventually use my help after he developed a plan to assist persons with albinism through an education program that would provide a safe environment and support the development of future leaders. I loved his plan and explained that I could help with kids’ vision so they could be comfortable in their educational environments, and maximize their chances of becoming future leaders who would help end discrimination. A year and a half later, in May 2011, the children sponsored by the UTSS Education Scholarship Fund enrolled in school and I planned my first trip to Tanzania to meet Peter Ash and his colleagues. I returned several times to Tanzania with a team of optometry students and an optician from my clinic, bringing specialized glasses, monocular telescopes and dome magnifiers. Over time we developed key partners in that country such as Rajeshwari Sagar, who was the president of the Tanzanian Optometric Society, and Sospeter Wilson, a local optometrist, who assisted me and raised awareness of low vision and albinism to their colleagues. During my last visit to Tanzania in May 2014, I met some key leaders from the U.K. based NGO Standing Voice, Harry Freeland and Jon Beale, who challenged me to simplify my clinical processes to try to reach more children all across Tanzania. Because of the common genetic type in East Africa, the similarities in vision findings allowed me to create a plan for identifying large groups to help them all with basic magnifiers, sunglasses and education about vision. 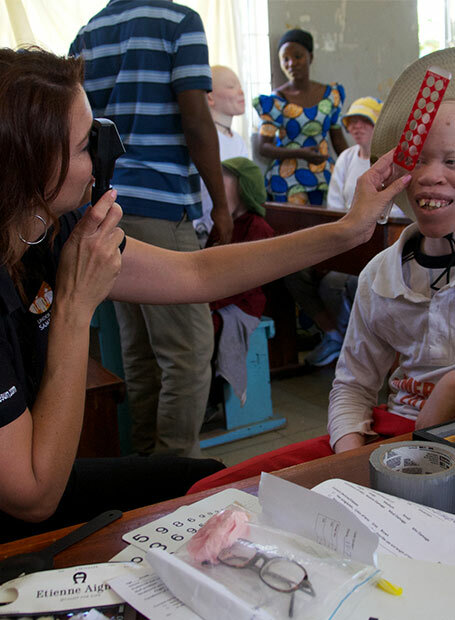 Our partnership incepted a pilot program aimed at educating teachers and key leaders on vision and albinism; providing low vision care for children in schools in Tanzania; and developing and training low vision centres to provide more extensive care when needed. We are producing education and training materials to support the program, and we hope later to make most of them available electronically to expand the program to other countries. I hope that all persons with albinism in East Africa could be educated about vision to expand their own understanding, and to know what resources exist to support them in obtaining an education that enables them to live a high quality of life, and enjoy the same rights as the rest of the population. Health and vision awareness for both patients and health professionals is my goal. For patients, it is so they can become their own advocates and find the care they need from compassionate and fair health professionals. For health professionals, it is so they can compassionately serve persons with albinism without bias and with strong reasoning skills, so they can empower their patients through healthcare and health education. For more information, media inquiries and interview requests, contact us.